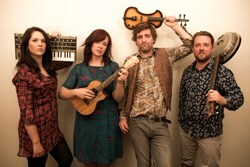 Infectiously fun and outrageously different, The Coconut Kids are an eclectic group that defy genres and styles. 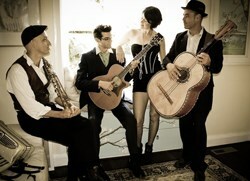 They've been wooing audiences across Australia and beyond with their own blend of French-influenced world folk using ukulele, brass, bass, keys, violin, mandolin and powerful vocals. The kids' unique sound will have you dancing one minute and in tears the next. They've cemented themselves as festival favourites playing across Australia - Caloundra (QLD), Winter Bello (NSW), Wintermoon (QLD), Folk In Broke (NSW), Blenheim (SA), Adelaide Fringe (SA) and showcased at the globally renowned music festival South By South West in Austin, Texas earlier this year. Downright catchy and heartfelt, and having a laugh along the way, they are riding a wave of buzz this year as they gear up for their 2018 European tour. Catch them now while they are still playing gorgeous intimate sets! 142 Katoomba St, Katoomba, Blue Mountains NSW 2780. Junction 142 is a family friendly venue! Children do require a standard ticket for entry. General Admission. Seating and standing/dancing room available.